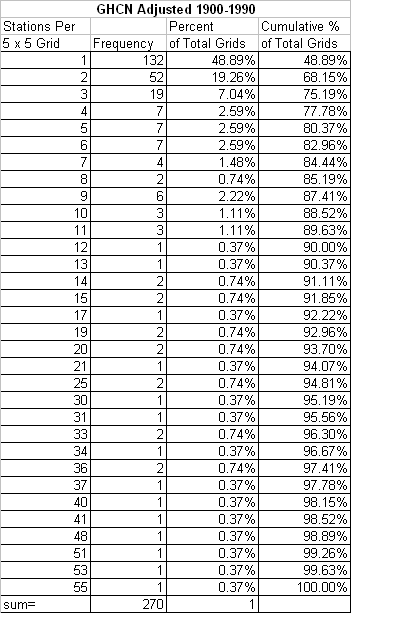 So I’ve learned a great deal playing around with the GHCN data, I think this is a reasonably significant post. Ya know, it’s hard to know anything until you try it yourself and I hope more of the readers here will. Again, there was a problem in my last CRU post, however, the more I look for it, the more avenues there are to explore. The issues have been corrected by avoiding the remaining possibilities in this post. Of all the details worked out over the last two days, one is a decent gridded average of temperature data. Unfortunately for us skeptics it looks like Figure 1 which is pretty similar to the CRU plot. Yes, there is warming according to our temp stations, but I don’t think comrade Phil Climategate Jones would like this curve, because the warming in this curve happens entirely after 1975. It’s nice to see a good quality CRU similar curve after the previous effort, but that’s how things happen when you do your work in public. The plot above uses all the data with each 5 digit temp station code averaged together individually, as my first post did. Anomaly is calculated over the entire series length. The concern which was explored in some detail, regarded the hypothesis that the loss of stations in recent years created or biased the trend. It came about since so many stations are lost in recent years as Ken Fritsch pointed out in the recent CRU #3 thread. I’ve run dozens of plots over the last several days, some of which contained an error in them created from data selection or a code problem in my previous post. Using the algorithm which averages together individual station ID numbers, I get very consistent CRUesque patterns. the warming is common to a variety of data sorting processes. This methods avoids the issues of data selection or code problems in the other methods and I’m confident in the accuracy of these results, but you should check them. Several methods were employed to test the consistencey of result, including sorting for Rural and Urban, and sorting for several different time lengths of station data. All varieties so far produced very similar same results. There are, however, interesting revelations from examination of the slight differences. Figure 3 is a plot is the urban data only. Of note is that the warming starts at 1978 with only slight warming beforehand and launches up about 1.2 C with no end in sight. Also, 1982 isn’t much reduced from around 1940 which is different from the global average in Figure 1. So the next thing I did was to plot the rural data. 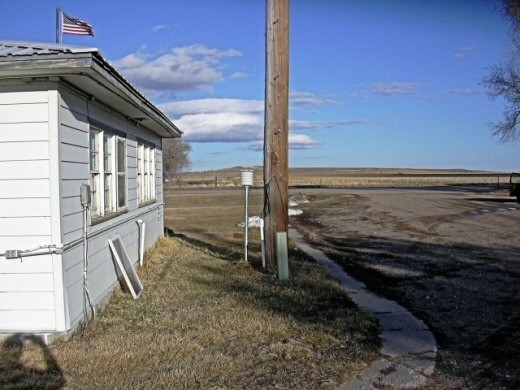 Figure 4 - Rural station data. That looks a great deal more like the satellite data. The temp rose and fell again prior to 1978 and rose again since 1978 is maybe 0.5C total. I tend to ignore data prior to 1900 due to the very small number of stations. I don’t think the drop in temps to 1900 levels in the early 70’s is the kind of curve that supports the high CO2 sensitivity claimed by climate science. Does anyone remember the snow storms of the early 70’s? Yeah, yeah just weather, I know. One of the other avenues explored at great length , yet still isn’t finished, was how station starts and stops affect the trend in recent years. To explore that, one of the several methods I used was to sort data according to number of available data points. Below, I presented the gridded global average for all stations with at least 100 years (1200 points) of available data, since many of the stations in Figure 2 were started in 1950. The urban data only in Figure 5 has an even steeper curve, you would expect this from longer series in this type of analyis. The temp rise since 1978 is about 1.2C. The rural 100 year curve is below. 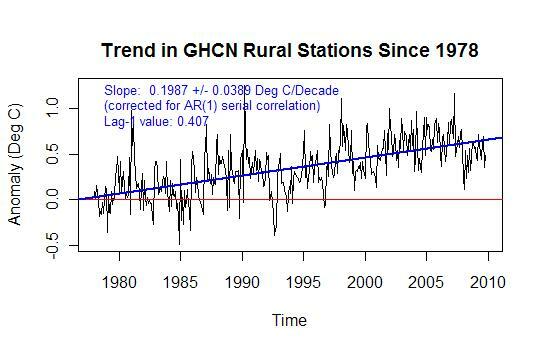 So the Rural stations show about 0.7C of warming since 1978. Visibly less warming than the urban stations by themselves. Also note the slight downtrend in recent years. Since the industrial revolution occurred a hundred years ago, it’s hard to imagine this curve is created by CO2. Still I’m not denying the heat capturing ability of CO2, just that the curves here don’t show a continuous warming but rather a short term recent spike. So of course we should look at the difference between urban and rural stations. Look at that curve! Despite the crudeness of the categorization of thermometers, there is a clear warming bias for big city data. The curve in Figure 8 ends at 0.6C difference. What’s more, the trend between the two looks statistically significant. If Phil Climategate Jones and Michael Marx Mann can choose which data they want to show and hide the rest, I think it’s only fair to choose to look at trends only from Figure 8 since 1978 (even though it won’t make much difference). After all, one hundred percent of global warming has apparently occurred since that time. Let’s do a simple significance test. Woah, it’s not even close, a trend of 0.12 and a no trend null hypothesis limit of +0.04. 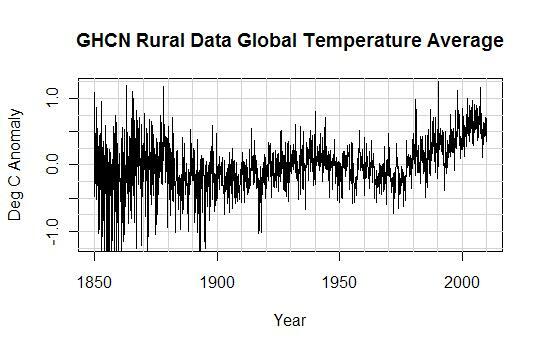 The difference between urban and rural warming is as great as the entire trend in UAH data over the same timeperiod. Just how much trend do the ground stations show. Even Figure 11 is still greater than UAH and RSS satellite data but it’s one heck of a lot less than the urban stations. Of course we would be remiss to not mention that WUWT has taught us what rural stations often look like. What could go wrong with sophisticated technology like that? The R code for this post is here. This entry was posted on January 5, 2010 at 10:18 pm	and is filed under Uncategorized. You can follow any responses to this entry through the RSS 2.0 feed. You can leave a response, or trackback from your own site. #1 Intersting point. I’m intersted in whether it’s related to the time integral of solar activity right now. If you integrate sunspots, the average activity launches upward since 1978. Now if it’s partially urban bias and partially sunspots, there isn’t much left for CO2, and that wouldn’t surprise me one bit. Honesty is the only path. Have you dug into the adjustments built into the GHCN data, and do you plan to? Wow, just how much is Big Oil paying you, anyway? But seriously, very nice. That rural/urban difference is substantial; do I understand correctly that the urban station data has not been at all corrected for UHI? 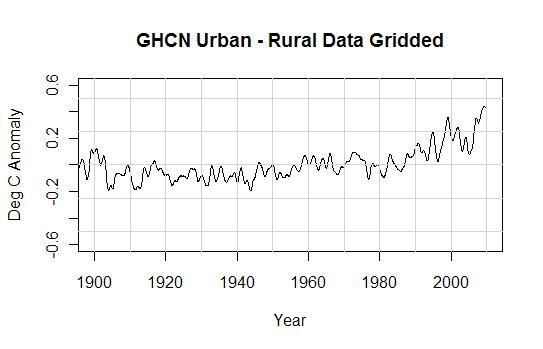 The rural only gridded graph looks very much like the results from comrade Jones et al, save for the pre-1940 period. Hadley and GISS graphs indicate the early part of the 20th century was substantially (~0.2?) colder. It could be that “estimated/interpolated” temperatures used by Hadley and GISS for empty grid cells makes a significant difference (assuming you are not including empty cells in the average). #4 I’m averaging together all gridcells with values in them equally. Unfortunately this weighting method favors the NH so I plan to do an area weighted plot of the globe in one of the next posts. As far as my relationship with big oil, let’s just say the last check was big enough to purchase all the unobtanium (hole filler) futures on the global market. Don’t even try to buy any. Another point raised at WUWT has been the gradual replacement of whitewash with latex paint on Stevenson screens. I am guessing that would have happened starting in the 1970’s. And it would have had an interesting impact on the averages as more and more stations are coated with IR transparent latex paint, the individual stations might show a very slight step change. But overall we would see more and more of these stations with the latex being added to the average so the average might seem to increase in a linear fashion. Before all of the stations were coated with latex paint, they would have then began to be replaced with the electronic devices which would have to be moved closer to buildings, etc. So maybe this causes another slight step up that is difficult to see on any individual station but in the average over time as more of these are changed, you continue what looks like a linear ramp up. That is until all the stations are done changing. Would plotting stations that still use only mechanical thermometers (can you determine that?) present a different trend? I have been doing a station by station look for ones near where I live comparing GHCN “raw” to GHCN “output” to GISS “Input to GISS “output”. Its fascinating to see the same temperature change 3 times from the obsevered reading. One little project is a little slow going, I’m going back to the paper records for a station getting both the mean and the max/min readings. Not to belabor the point, but your results are not reproducible without the stationid.txt data you are using. Could you link it or at least explain where you got it and what’s in it, including the structure? #9 Very sorry about that. I forgot you asked and that it was required. It’s been amazingly busy at work so blogging has taken a back seat. The file includes all the CRU station id’s which are required for CRU replication and are not required for this post. I’m getting fairly good at plotting stuff in a geo-referenced way. I’m happy to plot anything you have that has lat/lon coordinates in it. I’m really curious how the stations get gridded out, especially when they have to reach outside the box to find a station. At some point, when you are on the topic, consider making a file that has the coordinates of the stations AND the coordinates of the ‘destination’ of where the data goes to. I can draw little vectors that show the ‘outreach’. He combined all data (unadjusted) from stations within a 1 X 1 degree sector, then averaged. Not sure what CRU does, but GISS uses unadjusted GHCN and then applies their own adjustments, getting an even steeper post-1975 trend than yours. #12 His post is difficult to read, but it also seems to have a serious error. This post is correct in every way I can figure, and my posts do get beat to heck. Often, it’s difficult for me to read others work because it’s not expressed in clear code or methods. At this point, curves substantially different from these here IMVHO will require a bit of an explanation. Jeff, have you seen John Graham-Cummings several posts on the MET data and code? He found a bug in their perl script and offers a fix. Thought for the day. If CRU don’t think UHI is important, they obviously don’t think the elevated co2 levels in cities cause any additional warming. To my layman’s eyes that looks like a Damn Good Point. Are there any charts which detail the elevated CO2 in the cities? My suggestion is to look at each grid box and select the station with the minimum temperature trend for 1979 to present. Hopefully, this procedure would be equivalent to using the most rural station in each grid box and would avoid most of the UHI effects. #12 #13: As I understand Eugene’s data, the 613 stations he uses are just those with a continuous 1900 to 2009 record, and are not gridded to a global average and location is not considered. 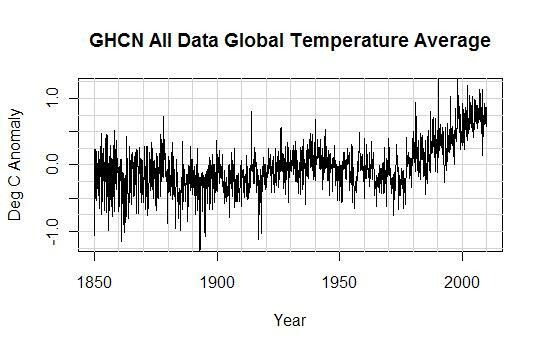 Does “All data global temperature average” for figure 1 mean all 4495 stations? If so, Figure 6 in the previous post showed a downturn at the end of the series, since around 1980, using an average of all 4495 stations. How has gridding eliminated that? Or was that plot in error (I realise you said it didn’t matter)? Last question, is your grigding altering the weighting of the boxes depending on latitude? #17, All means 4495 station ID codes, including their subgroups as well so there are something like 8000ish (I think) series. The boxes are weighted according to the cos of latitude. In my previous post, I tried to select the longest record for each gridbox. If it worked correctly, the result might have some meaning. Instead of figuring it out, I tried a variety of other methods which produce results very similar to those here. I need to go back now and see if a particular subset of each gridcell can produce the results of the previous post but it might just be an error somewhere that is difficult to find. Unfortunately for us skeptics it looks like Figure 1 which is pretty similar to the CRU plot. Perhaps said tongue in cheek, but subtle humor often doesn’t come across as it should over Al Gore’s internet. Minor comment — Figures 10 and 11 have different Y-axes, making the post-1978 urban and rural trends look more similar than they actually are. Great work Jeff. It will be interesting to see what this looks like once you consider the NH bias. Aside from the trend difference, what strikes me is how much the HF wiggles of the rural stations match up with the sat patterns. The same comparison of sat to urban looks much more noisy by my eyeball method. Another suggestion: use larger equal area grid boxes. For latitude, use acos(0.0), acos(0.1), acos(0.2)…acos(1.0) as the dividing lines. For latitude, use 10 degree widths. #20, I wrote it with a smile to see who was reading carefully. #16, Would you be ok with CRU sorting the thermometers for the highest trend? There is one minor thing to consider revising. On fig’s 10 and eleven, the size of the graphs are the same, but the scaling of the temps is different. To the casual climate web surfer, this makes the slope of the temp rise look the same. I would re-size Fig 10 so that the slope difference is visible when comparing at the graphs. No time right now to fix scales. It would have been better had I done it before posting. #2 about looking at solar activity..
What disappointed me was that (lagged) temperatures did not decline following the aa peak in the early 1990s. But, of course, your rural temperatures did decline. Makes me want to trust the satellite data only. You know this got me thinking; the land stations and data gets ALLOT of attention. 70% of the surface is over ocean though. Who is looking into this data? Not surprisingly they often have “sparse” data, even today. How many buoys were there in 1880??? It appears that NOAA at one time had applied satellite data to fill modern gaps but has since stopped using satellite filler, citing a bias that caused problems for users. I couldn’t find out what this bias is on their website. I would love to know what the sea surface temps looked like in gapped grid cells, with and without the satellite filler. #27, I wrote to Anthony Watts to ask what the official position of the climatoknowledgists is on UHI b/c it’s a bit confusing for me, unfortunately he didn’t reply. If someone knows the answer I would appreciate it. I wasn’t at all disappointed with this result. If warming only occurs after 75, it’s hard to attribute very much of it to CO2. Also, if the warming can be so positively connected to UHI, the net result will be that all stations should be questioned as the surfacestations project will probably conclude. Even using their own rural/urban sorting results in a definitive result of UHI. LIMITS ON CO2 CLIMATE FORCING FROM RECENT TEMPERATURE DATA OF EARTH, by David H. Douglass, John R. Christy, Energy & Environment, Volume 20, Numbers 1-2, January 2009. Pretty clear that the CRU temps are biased high — assuming UAH got the sat. temps right. — for an updated graph of UAH satellite temp data. #31 I agree that CRU is biased high. UAH isn’t perfect though either but I don’t know which way it goes. As to the second link, I like mine better. 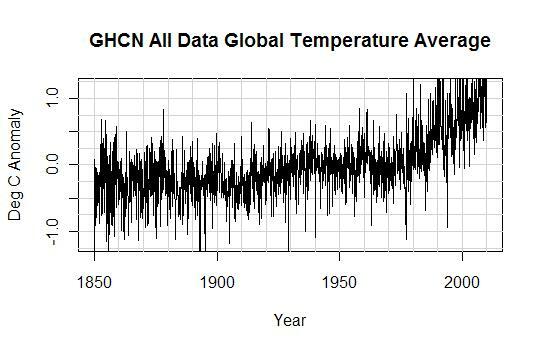 I think it is important to remember that GHCN uses adjusted data were there is sufficient spatially adjacent data to do their adjustments for homgeneity by differences temperature series and looking for change points (breaks) in the difference series. Where there is insufficient data (adjusted or unadjusted) to do the break point analyses, GHCN uses unadjusted data. except for TOBS in the US and they do it because they have insufficient trust in the meta data formerly used to make homgeneity adjustments. GHCN does not acknowledge a need for TOBS in the ROW – which I have not seen documented. Reading about GISS, I found that they do some rather subjective adjustments to data when they see change points. the coast have diminished UHI due to the constant on-shore breeze coming off of the Pacific. This effect dies off as you move inland. urban and rural temperature chart, expect to see a divergence between them. Just looking at dozens of rural temperature charts, I really do not see anything that alarms me. What urban/rural classification do you use? The GHCN U=Urban/S=Small town/R=Rural or the brightness classification A/B/C? I’ve checked both for Sweden where I am familiar with most sites and the U/S/R is not very reliable, for example airports way out in the boondocks are classed as urban because they share name with a major city. The brightness classification is better, but also wrong sometimes because the coordinates are off. In New Zealand there are now (2009-2010) only a few climate stations reporting to GHCN. Some of these have UHI issues and some have other local siting issues (as per the surface stations project). But as it happens there are dozens of rural climate stations throughout the Country that have very good longish records. Most of these sites do not report to GHCN. The data is freely available by signing up as a user of the National Climate Database that is maintained by NIWA (National Institute of Water and Atmospheric Research). Other data that are available include stats on wind, humidity, evaporation, soil moisture, heating degree-days etc. Thats rather alot to get ones head around. Some stations don’t have all the data but some have most of it. The soil temps are interesting as these can potentially be used to verify local trends in the air temp. Also when one starts to get down to this level of detail it becomes more apparent which sites are truely rural and which are not. Even for the urban sites one can begin to detect whether the UHI effect is increasing or whether it has stabilised (by comparison with nearby rural stations). I suspect that this is at least part of the answer to Doug Hoyts rather “tongue in cheek” comment on station selection. It is likely that most other “westernised” countries have archives of this type of data. What is perhaps needed is the compilation of a more comprehensive open-source global climate database containing an array of different datatypes. Then it would be possible to get some genuine climate research done. (Rather than the sloppy secret squirral stuff we have been forced to accepted so far). Anyway, keep up the good work Jeff. I always enjoy your postings. Jeff, any idea as to why WUWT seem to have pulled this from their website? #38, It’s going to run at 6am tomorrow. The shape similarity of figs 3 and 4 suggests that most rural stations became urban stations by population encroachment. Therefore subtraction of rural from urban (on a year by year basis with no lag) does not reveal a true magnitude, but a reduced one. The true magnitude, by measurement, can be rather more – transient events of 10 deg C have been reported (lit cit). Hypotheticals. 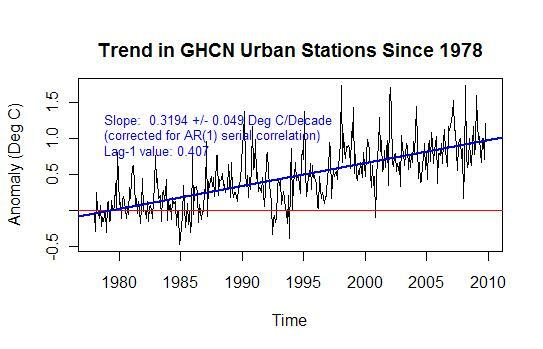 (1) Urban stations reach a maximum UHI temperature difference once they exceed a threshhold population. The in-city met station does not get a much warmer peak, since the warmth is merely spread over more hours each day. (2) Most urban stations maxed out by 1950. (3) Many, if not most rural stations started to get UHI effects by 1980. (4) Overall, the UHI temp effect is still increasing for rural stations (although there are some with no UHI because of local siting). Thus, year-on-year subtraction understates. Observation: Truly rural seaside stations in Oz that I studied in a small set show no discernable temp increase since 1968, when I started the study. This observation needs to be explained in any analysis. Rough solution. With your data, add a time axis lag before doing subtraction of rural from urban. e.g. On the rural fig 6, make year 1900 equal to year 1930 etc, then subtract from urban fig 5. Best to stick with data with 100 year records as you have done later. This is rough and ready, but I think it will give a better magnitude for recent city UHI. UHI in my home town of Melbourne has been studied at leat at http://www.earthsci.unimelb.edu.au/~jon/WWW/uhi-melb.html ; and http://www.earthsci.unimelb.edu.au/~ihs/publication_pdfs/Morris%20Simmonds_UHI+synoptics_IJC%202000.pdf ; and http://arts.monash.edu.au/ges/research/climate/urban/ ; and http://www.warwickhughes.com/climate/gissbom.htm. deg C warmer than the airport. So, not just Tmax and Tmin should be considered, but the daily profile of each. Shame we do not have this in historical data. Caveat: Nothing I have written here endorses the accuracy of your data sources which remain open to many questions. Exactly right IMHO. You should consider a decent writeup on your findings. I might know a blog owner who I have some sway with. My writeup is now over a year old and we have moved on. As to your hint that you might just know a blog owner …. Why, I could never have that suggestion appear next to my name if emails were made public. Seriously, I have more work to do before going public, if people accept my submission. My data set is too small and I cannot be sure of its provenance. I’m working towards getting really raw data, but it’s not easy. The big unknown at the end will be meta data, like precisely where the met station was positioned re the town in each year. Very good work! Eyeballing figure 8, it seems to me that it’s quite probable that we’re already on our way down from a local maximum that was reached around 2004-2005. Further, the difference between that maximum and the previous local maximum in 1940 is about 0.4C. I have guesstimated a value in that range before, seems very likely to me. So we’re looking at 0.4C/65 years which could be explained by CO2 – but it could also still have other explanations, e.g. that there may be fluctuations with much longer “wavelengths” in addition to the ~65 year cycle (if there is any regularity to long-term temperature fluctuations at all, of course – I’m not quite convinced there is). Jeff ID, in my continuing analyses of the GHCN station data, I broke down the historical AL and Adjusted GHCN series for WMO and Near WMO stations. I have two graphs linked below that show these results. The R code is listed below. 1. I have not been able to find, in any detail, what exactly a WMO station means other the WMO receives data and meta data from these stations. 2. This quest becomes more important since I found that GHCN has only reported temperatures from WMO stations over the past 3 years, i.e. 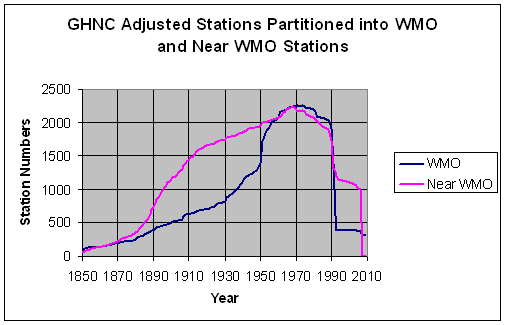 no more Near WMO stations (see the linked graphs). I am currently looking for an explanation of this development. 3. The Near WMO stations are mainly stations located very near WMO stations, but not all are. A few have no “mother” WMO station. 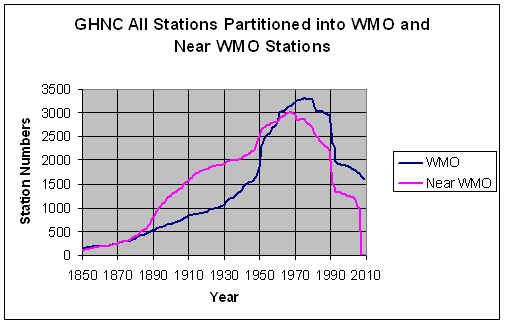 Notice that over time the GHCN total stations are approximately evenly divided between WMO and Near WMO stations. In effect this means a lot of rather redundant temperature data by very close proximity stations makes the station numbers more impressive than they really are in spatial coverage. 4. My next analysis will be to look at the how many stations are within x distance (degrees of latitude and longitude) of other stations and how that metric has changed over time. After that I want to see how much stations in very close proximity vary in temperature trends over various periods of time. You may have already known this, but, yes, the IPCC claims global warming has only been occurring since 1975. And since a “climate cycle” is 30 years long, that means we have a sample size of 1.5 in our discussions about the global warming. In the full sample size there was warming. In the second 0.5 sample size (the last 12 or so years) there’s been no warming. At a high level, that represents the sum of our empirical knowledge about global warming. Given the Eastern Europe and much of Asia continued polluting (and probably still do in many places) well after the 1970s I find this “convenient” theory dubious, not least because it fails to explaint the similar decline in the early 20th century before the warming of the 20s/30s. It might vary with country, but there are examples where the WMO stays the same over a term of several met station shifts. that would affect the climate data record for that site (measured in terms of air temperature and precipitation). Significant station moves are an example of this. Some stations also possess a World Meteorological Organization (WMO) station number. can be reassigned to another station if the new station takes priority in the global reporting network. There are discrepancies. The famous Darwin has WMO # 94120, but this is not on Aust meta data online sheets I have looked at and it covers about half a dozen sensor shifts, one of about 15 km. Good luck with your distance project – admirable persistence. There is a whole story yet to unravel about the correlation versus separation metrics of sub-daily, daily, weekly etc averages, including uncertainty terms. wouldn’t the “law of great numbers” lead us to guess that adjustments would center on zero, except for the case when we have a clear overall bias such as industrialisation/urbanisation of large areas? When I read that in total adjustments add significant warming trends I become suspicious. If it should have any trend, it should be negative to cancel for urbanisation, the only large scale cause for adjustment with a clear trend in itself? I find the odds for time of observation etc exposing such a clear trend to be low. Are you aware of any published rationale for adustments in total being positive? Mr. Fritsch, is this where you might detect station migration bias discovered, displayed and discussed at length by E.M. Smith at chiefio? Re: #53, to be more clear, “the southward migration of the centroid of the population of stations included in the GHCN report. In other words, the replacement of cold stations with likely warmer stations over recent years. re #54. I should spend more time waking up before wasting all your time with incoherent babble. southward migration of the centroid would be in the Northern hemisphere. sorry. My purpose here was to show that many 5 x5 grids have only a single station over time (29.9%) and then ask the question of how we can determine the uncertainty of using a single station to represent this grid area. 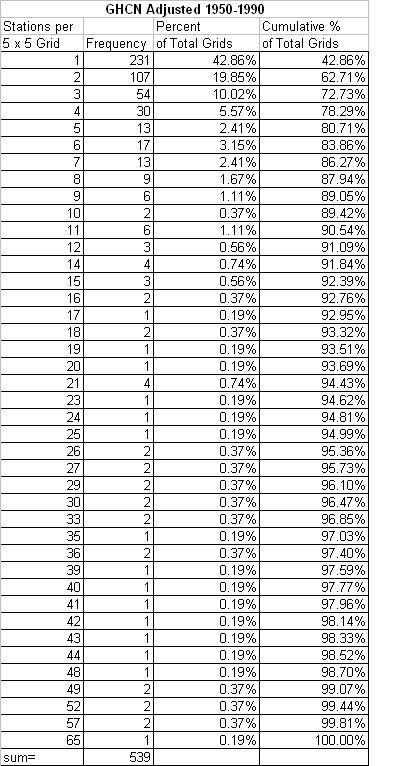 The results are listed in the graph which shows the cumulative percentage of the stations that are located in the grids at rates of 1 per grid and 2 on up to 100 per grid. The graph and the table show that many grids have few stations while a few have many and as many as 100. My thoughts at this time are that those grids with many stations (providing they have sufficiently long histories and adjusted temperatures) can be used to determine the variability we can expect from using any given number of stations to average for a grid temperature. I want to look at temperature anomaly trends. I may want to look also at unadjusted stations as the homogeneity adjustments could have the affect of decreasing the grid variability. #56, That’s an interesting post. I don’t have time to write it up but people should check out just how much coverage we actually have. One project rolling around my little brain is a video of the whole earth depicting active temperature stations over time. It would appear to me that Jeff Id’s analysis confirms that Hansens’s crew is doing a pretty good job of adjusting for the UHI effect in their GISTEMP product. Looking at numbers 1978-present, Jeff Id found a decadal trend of .20C/decade for rural stations. GISTEMP land only product over that period shows a decadal trend of .18C/decade. #58, Nope, this post shows the difference between urban and rural temperatures. By simple gridding the trend is heavily weighted to the northern hemisphere which has more warming. Pay no attention to the trend only the difference in trend. I was just going to suggest the same video. You know when you attempt to summarize and show what is important for spatial and temporal coverage of these stations it gets a little complicated. A light show video would show it, but I need a snapshot (or several snapshots) to really digest what that coverage means. That would certainly be very instructive and it is one of the things KevinS hopes to do with the data he is working on here. At the moment it is in database format and interactive maps (e.g. :http://82.42.138.62/MapsNOAA.asp) but one of the original ideas was to have the maps show changes with time. #46 After that I want to see how much stations in very close proximity vary in temperature trends over various periods of time. That IMO is one key area for showing how flawed much of the current analysis is. Commenter “lws (06:46:41)” over at this thread on WUWT pointed out three such stations in Dallas (although the point made was about UHI). The maps mentioned in comment #61 above might suggest others as the stations are color-coded by trend and clicking on them opens a graph of the data. On line 3 of your script you’re reading from the clipboard. What is supposed to be on the clipboard and why not just read it from a file? In the broader sense, without invoking mechanisms, this might be a plausible interpretation of the graphs. However, about half of the Australian rural stations I have studied show no temperature increase at all since I started looking in 1968. Mechanism therefore becomes important. Unless you can explain the mechanism that allows many stations to show essentially no temp change in 40 years, it is perhaps premature to suggest that a mathematical (as opposed to a physical) method is superior. #63, Sorry about that, I was testing some of the breakpoint algorithms in R. The lines do nothing. #64, I’m starting to see that I shouldn’t have published this post until I had all the area weighting done right. In this version, Australia got a very low weight, the trend was intended only to show the difference between urban and rural. If there is time, I’ll do an area weighted plot this weekend which due to the low trend of the SH, will reduce the global trend substantially. 1. Stations with no time period restrictions except the standard one of having at least 10 years worth of data. 2. Stations that covered at least the time period 1950-1990. 3. Stations that covered at least the time period 1900-1990. 4. Stations that covered at least the time period 1900-2009. I chose these time periods as snap shots of the period that would be of most interest for the effects of AGW on temperature trends. I did not go back further than 1900 as the data the further you go back, in my view, has large uncertainties (not that it cannot going forward). I wanted to see how the station distribution thinned out as the time periods of interest increased. What is of interest here are the uncertainties that arise from stringing together short segmented temperature times series to come up with an average temperature for the 5 x 5 grid. I am not at all certain that that uncertainty is well acknowledged or accounted for by the temperature set owners. I also am concentrating here on the adjusted stations as the owners go, obviously, to great lengths to provide these adjustments and inform how necessary the adjustments are. As I discuss my findings below, it will become obvious why GHCN states that they use unadjusted data to make their first difference homogeneity adjustments – they run short on adjusted stations. I have linked four tables below that summarize the data for the stations meeting the time series lengths given above. 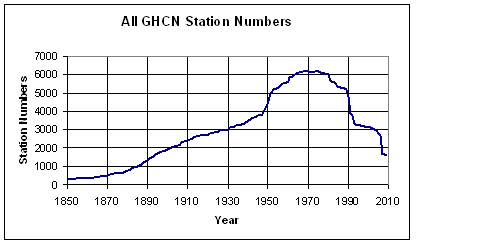 Remember that the number of grids occupied with GHCN All stations was 891 and that number agreed reasonably well with the expected number given the land to global area ratio and the grids that would contain land at sea at the boundaries. Actually a plot of the GHCN All stations on global coordinates shows the outlines of the various continents. For the adjusted stations with no time restrictions, 713 of the 5 x 5 grids have stations and indicating that something on the order of 25% of the global land 5 x 5 grids do not have stations with adjusted data. The percentage of stations with 1 or small numbers of stations per grid goes up from what we saw with the GHCN All station distribution with 1 station per grid occurring on 35% of the populated grids, i.e. grids that have stations with adjusted data. The percentages for 2, 3, 4 and 5 stations are 14%, 11%,7% and 6%, respectively. There are 19 grids with 40 or more stations per grid and it these grids that can be used to determine variation within a grid area. The 1950-1990 time period minimum has 539 grids occupied with the 43% of the occupied grids havening only 1 station per grid and for 2, 3, 4 and 5 the percentages are 20%, 10%, 6% and 2%, respectively. There are 12 stations with 40 or more stations per grid. For the longer 1900-1990 minimum period there are 270 occupied grids with 49% with 1 per grid and 19%, and 7% for 2 and 3 stations per grid. There are 6 stations with 40 or more stations per grid. For the longest period 1900-2009, there are only 67 grids occupied (out of a total of 890 or so possible) and those with 1 station per grid is 90% and no grid contains as many as 3 stations (1 grid does). The next step is to measure the within grid variation in temperature trends. If those trends correlate very well, the use of sparsely covered longer segment time periods could be used without introducing large uncertainties in grid averages. If this is not the case then the next step would to determine the uncertainty of splicing shorter segments together and the availability of shorter segments for splicing. I constructed graphs of the station data and calculated breakpoints. I will be happy to provide the R code and methods to anyone who might be interested in doing some of these calculations. I started with the grid which happens to include my home address in Illinois and is located at >40N to =45N and >85W to =90W. I have started my analyses with only those stations that have extended and complete data and used adjusted data. In this case I used the period 1900-2005 for the GHCN adjusted temperature series (from KNMI) and found 19 stations in this grid that met that criterion. My results are summarized in a table of the trend slopes for the 19 stations, the SE of the slopes, the probability that the slope was zero by chance and the AR1 auto correlations of the residuals for regressing temperature anomaly against time (years). Some example of the temperature series and breakpoints are given in the linked graph. Before discussing the results of my analysis I want to point to some issues I had in downloading data from KNMI and ask the question whether I might better go directly to using GHCN data as Jeff ID has done in his posts here and whether I can look at individual stations. I was able to manipulate the station data from KNMI in R but I ran into a problem of having to do some of the radio button (correct terminology??) pushing manually. This action did not significantly slow the overall process but it was not as elegant as writing a program to run start to finish without human intervention. I recall Steve M running into a similar problem using KNMI for auto downloads and I do remember that he overcame that problem. The discussion of the results is best started with inspection of the graphs of the station temperature time series and breakpoints. First I found that 6 of the 19 station series had at least one breakpoint. One station had 3 and another had 2 breakpoints. Breakpoints are determined based on statistical significance, but a visual inspection of the graphs shows a break in most at around the year 1957. Based on that observation I used the time periods for my trend calculations (see linked table) of 1900-1957, 1958-2005 and 1900-2005. I also found for 4 stations breakpoints at 1997 which on further visual inspection shows the same (though not significant) break in most of the series. So what are these features that appear rather consistently in most series telling us? I think it shows that the general changes in the climate, that these breaks indicate, are occurring across the 5 x 5 grid area. It should be remembered that I am working here with adjusted data and theoretically adjustments for non-climate non homogeneities have already been made. That adjustment might also decrease the trend variations that I will discuss below. We can also probably conclude that features occurring in most or all stations in an area such as this one are from climate and not station non homogeneities. Having said that about the station feature commonality, if one looks more closely at the segmented trends, they appear different from station to station. That observation is borne out in the discussion below of the trend data. The table summary can be further summarized here by noting that from 1900-1957 the range of trends is from 0.1 to 2.4 degrees per century (mean = 1.44 and Stdev = 0.70) with an approximate +/- 1.4 on most station trends, statistically significant trends for 10 stations and relatively small AR1 on the regression residuals of 0 to 0.26. 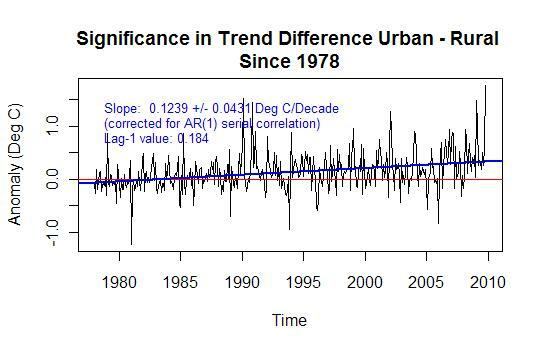 For 1958-2005 the range of trends is from -0.3 to 3.5 (mean = 1.77 and Stdev = 0.92) with an approximate +/- of 1.8, significant trends for 8 stations and AR1 from 0.0 to 0.14. Finally, for the entire period from 1900-2005 the range of trends is from 0.1 to 1.4 (mean = 0.64 and Stdev = 0.36) with an approximate +/- of 0.54, significant trends for 13 stations. The trends summarized above, in my mind, show considerable variation and that further shows that climate can evidently be very local. This situation, in turn,adds to the problem of allocating, with good certainty, an average temperature (trend) to a 5 x 5 degree grid with only a few stations. Remember that I have used adjusted data that may already be averaged to some extent by that adjustment for non homogeneities. 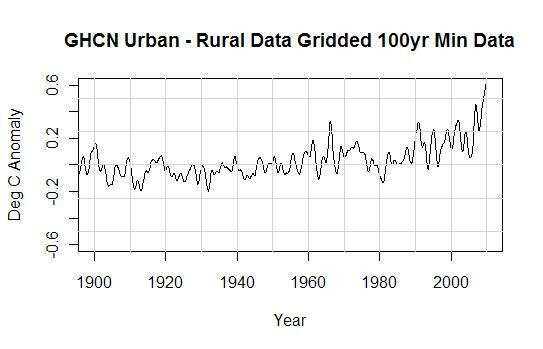 Grids do have other adjusted data that comes by way station data that covers only part of the extended time periods of interest. I am curious at this point how homogeneity adjustments are made for short lived stations as the calculation of breakpoints (change points) depends on have extended series. I plan to continue to do more of these analyses using grids that contain a reasonably large number of stations for making comparisons.